Ancient art, high on rock walls Bears witness to those who’ve come before. Who were they, those long-ago people? Our footsteps echo their trails. Down a long dirt road, red dust coating the interior and exterior of my truck, Teresa and I rattled our way to the Horseshoe Canyon TH. We hiked down into the Canyon, the sign said an 850′ drop (which we’d have to climb on the way out). The day was beautiful–warm, sunny, not too much wind. We wandered along the dry river bed, looking at first buds on cottonwood trees, early flowers, and red canyon walls. Our goal was the Great Gallery, though there are three other galleries along the way, all beautiful. Archaic people created the Great Gallery pictographs,called Archaic Barrier Canyon Style. These pictographs have been aged to be up to 6-8,000 years old–the oldest ones, anyway. One of the pictographs is identical to a figurine found in a 6,000 year old layer. IT is possible these were considered sacred sites to late people–those who came 3,000 years later. The climate was changing from cooler and moist to dry and warm, so perhaps that has something to do with the purpose of the pictographs. One of the figures looks like a bison–one of the extinct bison? 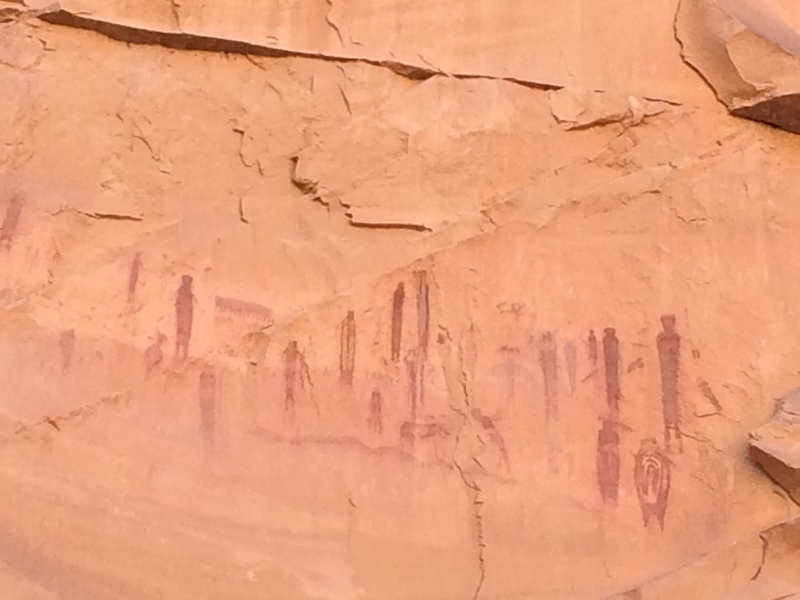 Later, Fremont people created some of the other pictographs. These are more recent, some are less detailed. I wish I’d carried my binoculars in order to see the pictographs more closely, but the Park Service had thoughtfully placed ammo cans at the Great Gallery, one of which held serviceable binos. I also wish I’d taken my ‘real’ camera–I just got an Iphone 5S, and have been experimenting with using the camera for photos. While it takes amazingly great photos, I’d have liked a closer zoom and the ability to use a few more features of a camera. We were fortunate to meed a Park Volunteer who told us about what we were seeing. When I got home, as I was deleting old downloads, I found a pdf file on Horseshoe Canyon–one that the volunteer had recommended! Huh, don’t know when I downloaded it, but it’s very cool. Good info.